When Greenwarden of Murasa enters the battlefield, you may return target card from your graveyard to your hand. When Greenwarden of Murasa dies, you may exile it. If you do, return target card from your graveyard to your hand. Hey man, sorry I couldn't comment until now. Love the list so far. 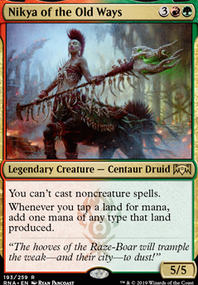 I'm also honoured to receive the mention in the title :) Mayael the Anima is a commander I have written essays about on this site -- she is a creature-based commander that rarely will cast one from your hand, and allows you to approach the game from a draw-go style of play. Anger is great. It works very well since there's less GY hate than enchantment hate. But Rhythm of the Wild has been very effective for me, too. 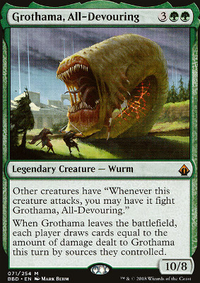 Novablast Wurm synergises with indestructible effects, probably the most famous being Avacyn, Angel of Hope , and Spearbreaker Behemoth , which is see is already in. It looks like heaps of the creatures are solid, I think what will be good is deciding what type of instant / sorcery / enchantment package you want to run. For me, I found running a lot of removal was fairly redundant, as my big creatures usually won the trade off anyway. Over time I have shifted my non creature package into a variety of cards that seek to further the win strategy of the deck. Card draw doesn't bother me too much, as I usually have a full hand, and merely Mayael into what I need. I chose over time to focus more on recursion with Creeping Renaissance and Greenwarden of Murasa . But if you double down on removal, it means your creatures will punch through more often. A terrific budget inclusion is to run an Illusionist's Bracers . Bracers when equipped to Mayael gives you TWO activations. Super cool that you got to the 100% competitive mark, but that being said you are making some decision that are in my opinion crucial mistakes. That fact that you leave Crucible of Worlds out is something I don't understand. 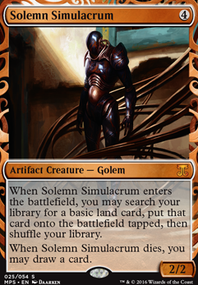 Crucible is the engine in any omnath deck, especially combined with things like fetches. 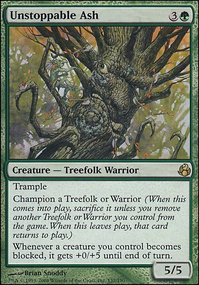 You can keep going and going and going, basically every fetch is a recurring ramp spell that you can play for nothing. Creating 2 tokens, that can hit or be sacrificed for damage. It is truly insane and often the card that will win you the game. Supported by Titania, Protector of Argoth you have another win con. Also Scapeshift wins you the game. Any day, especially with a sac outlet arround and a, guess what, Crucible of Worlds or Ramunap Excavator on the board when things don't go as planned. 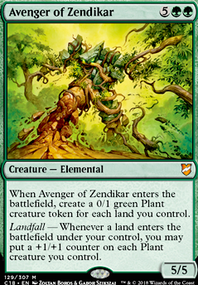 Even if you dont play crucible or the ramunap, scapeshift is basically a win if you played Avenger of Zendikar the turn before. That being said you are truly in a very good direction, but to make the deck competitive (again the tapped out meter doesnt say that much) you need to focus it more. 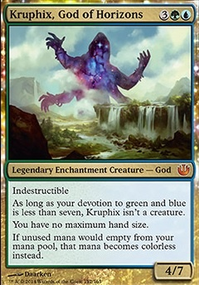 And omnath is all about dropping lands, everything else doesnt matter. You dont play interaction with anything on the board. Enchantment/Artifact is for the weak. 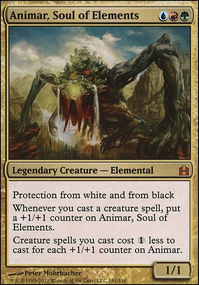 You play player removal with omnath, someone drops something threathening? Here is 15 elementals in your face, sac them all and divide 45 damage to kill another player off. Fastest I won with my build is turn 4. (was a god hand but still). Often I drag multiplayer games in around turn 6-7. I do agree with you on Nissa, Vital Force She can be underwhelming and with cards like Greater Good and Perilous Forays you have better card draw then her. The only thing that helps her is that her +1 is powerfull since she can protect herself for one turn and then ult. Right now I play Altar of Dementia , often I have around 15-20 elementals, wich means I can Swing/Sac/Mill almost 3 players out of the game in one go. But she might find her way back in, or Greenwarden of Murasa but that would mostly be for the recursion. 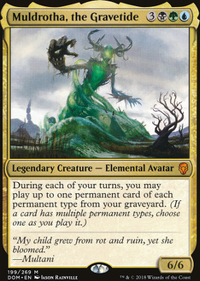 Also: Oracle of Mul Daya , Azusa, Lost but Seeking , Lotus Cobra , Mina and Denn, Wildborn are crucial in any land matters deck. Cause they keep the land drop engine going and often one of these give you a turn 4 omnath. Also Burgeoning with Ghost Town gives you a land drop on each of your opponents turn, if you take Ghost Town back to you hand before they go into first main phase. My build is basically the top deck on tapped out with a few cards changed regarding my meta. Omnath, Locust of Rage-deck. Hopefully it will help you a bit. What do you think of Wilderness Reclamation ? Lets you untap end of your turn giving you mana for Mayael's ability. Also if you like that there's Seedborn Muse and you can do it every turn? Gross! Does your deck need card draw? Does your hand get empty often? Benefactor's Draught seems conditional would you be better with a card like Guardian Project ? Have you thought about playing Combustible Gearhulk ? With 31 cards with a mana cost above six you ether draw three cards or deal a healthy amount of damage. 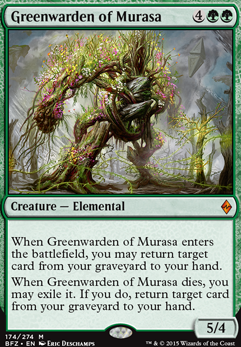 What are your feelings on Greenwarden of Murasa vs Seeds of Renewal ? Greenwardens cheaper and can be hit by Mayael.